And, thanks to U.S.D.A. marketing schemes, cheese consumption and availability has tripled since 1970. Mozzarella surpassed cheddar as America’s most popular cheese for the second year in a row, reports the U.S.D.A. Another fun fact: Since 1970, cheese consumption and availability has tripled. This is due to two main factors: Resealable bags of shredded cheese make it easy for home cooks to add cheese to any meal, and Mexican and Italian restaurant see piling on cheese as a great way to separate themselves from the less cheesy competition. More cheese on that chicken parm can mean more customer satisfaction and higher profits. No wonder Domino’s redesigned their pizzas in 2010 to contain 40 percent more cheese. And Modern Farmer reports that just last year, Pizza Hut released their 3-Cheese Stuffed Crust Pizza, which, as you can imagine, adds a whole lot more cheese to the pie. With the help of Dairy Management Inc—a marketing creation of the U.S.D.A.—Pizza Hut found that Millenials can’t get enough of large quantities of blended cheese. Dairy Management Inc is also behind the “Got Milk” campaign, which comes as no surprise to anybody. Dairy Management does not rely on American tax dollars, but instead checkoff fees from dairy farmers to fund marketing campaigns. Those farmers cough up hard-earned money with the understanding that Dairy Management will push their products. And push they have—in recent years, cheese has been the most popular vehicle for dairy. 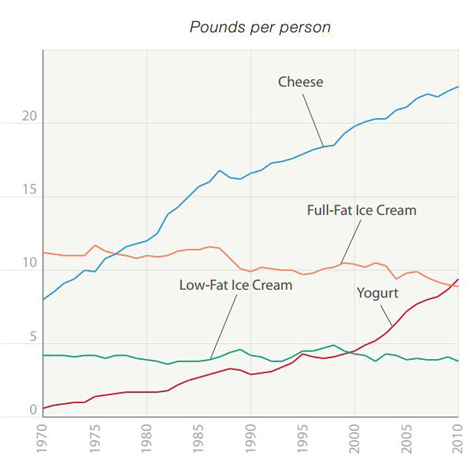 Americans have been eating less full-fat ice cream and more low-fat (but very sugary) yogurt, due to government warnings about Saturated fat. But that doesn’t mean Americans aren’t going absolutely crazy for cheese. Doesn’t this just make you feel like an engorged puppet being force-fed cheese and low-fat yogurt by the U.S.D.A? Us, too.